I'm a Software Developer living and working in Belmont California. I'm currently working for Volkswagen developing AR and VR applications for product design, testing, and visualization. I previously worked for Microsoft with the Office 365 team developing network health monitoring software for email services. 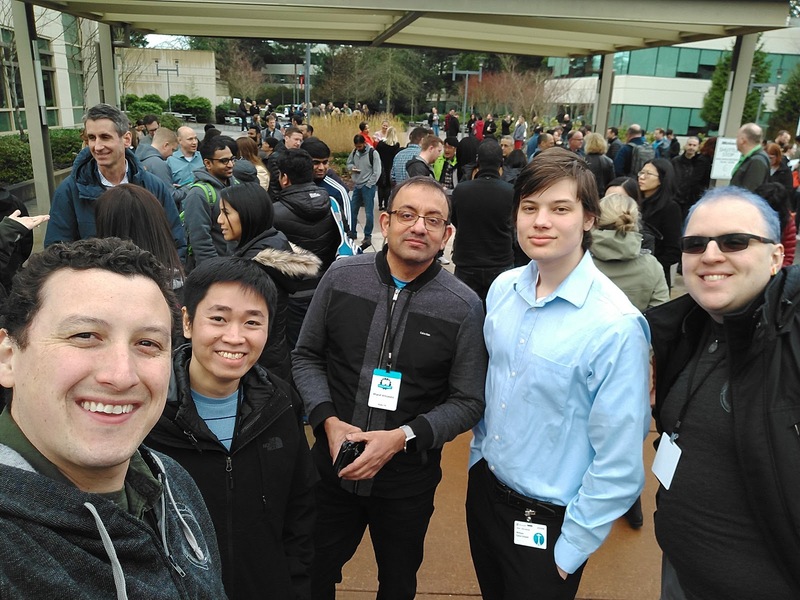 I previously worked for Ong Innovations developing primarily business applications in Unity3D with C# for the HoloLens and Virtual Reality devices. This most recent application is a mapping project to plan and demonstrate the route of trucks carrying large objects like wind turbine blades. It's being developed primarily for Google Daydream, ARCore/ARKit, and SteamVR. I worked on a remote assistant application (not shown here) that uses WebRTC for voice, video, and data transmission. It runs on Android and the HoloLens. More generally, I have done many projects using Photon to network multiple users both locally and remotely. 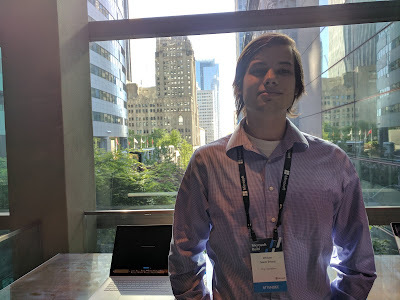 I also contributed to the MRTK repository by creating a standard universal networking tool that could operate with Photon, WebRTC, or other solutions interchangeably with no work from the developer. I also worked on a smart city visualization application with points of interest and panels of information. We modified it as a demonstration app and added a data sphere with imported solar energy data from the US DOE. This is a cross-platform Windows Mixed Reality app for the HoloLens and immersive headsets. There's another multi-platform app that focuses on recycling education that works on the HoloLens, WMR immersive headsets, and iOS with ARKit. I worked on a multi-user 3D model viewer demonstrated below developed for the HoloLens. Multiple users could interact with the same environment simultaneously and sessions were stored on the Azure cloud. I also built this street sweeper training app shown below for the HoloLens. I had to dynamically load in assets at runtime to optimize memory usage. I also worked at Studio 216 for a short contract to help them out with a couple of projects. The following is a simple project I spearheaded there to demonstrate how different cabinet and table materials and designs would look in a particular laboratory setting. I was responsible for writing every bit of the code new code for this project including revamping the "dollhouse" miniature model you see in the video nearly from scratch. This particular app was build primarily for WMR but works well without modification in the HoloLens. While at Studio 216 I also developed a traditional 3D photo-realistic experience for desktop to place sculptures in an environment and see how they would look. I was entirely responsible for the controls which included an XBox controller, a flight sim joystick, and mouse/keyboard controls. I also created all the menus and placement/edit behaviors. 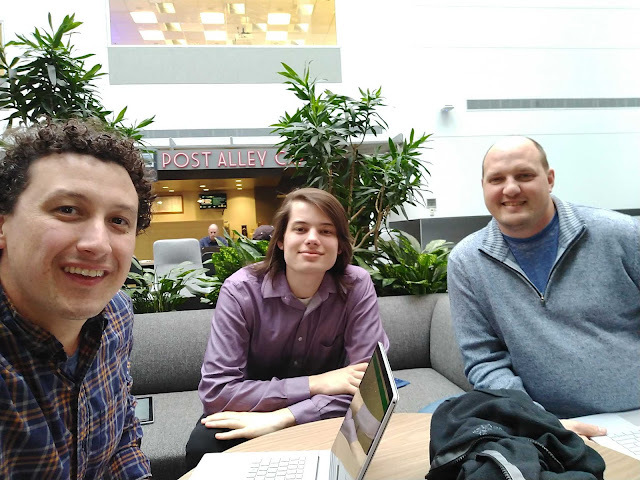 Both at Studio 216 and Ong Innovations I have and continue to work closely with Microsoft, specifically the Mixed Reality team, to improve SDKs, developer tools, and provide feedback. Before all of this, I graduated High School after only nine years of school rather than the normal twelve. I passed five AP (Advanced Placement) exams in Statistics, Micro-Economics, Chemistry, U.S. History, and Calculus. I've also taken a half dozen courses at De Anza College in Cupertino CA including C++ courses. I transferred to Bellevue College and finished my Associate's Degree and took advanced calculus, C++ data structures, and physics. In terms of work experience, I started off with an internship at my father's company, Anybots Inc. 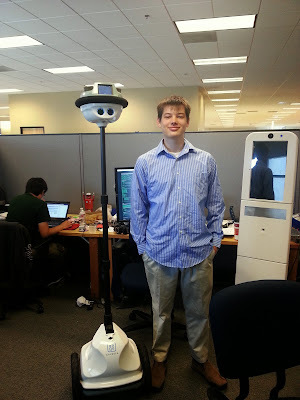 The company made what are called "telepresence robots". Imagine Skype on wheels if you will. They looked a bit like a Segway without the person. I learned Python on the job there and also worked on a mobile android application to control the robot but there were issues with the back-end that prevented it from being usable. More enjoyably, I worked as an IT consultant at a fantastic small company in San Jose called TapClicks Analytics. I gained lots of valuable professional IT experience and made fantastic professional relationships. I've worked on a decent number of personal projects based on Python and Java including a group project using regex to comb websites and collect relevant event information. I have developed a solid rudimentary understanding of web development. Notably I've acted as the resident IT guy for friends, family, and myself. I've installed Windows more times than I can count, removed malware in numerous neglected machines, built computers and upgraded components for myself and many others, I've set up backup systems, configured VoIP systems, and recovered my bricked android phone from a bad flash more times than I can count. I'm particularly interested in the inner workings of display technologies, processors (namely graphics processors), and electrical chemistry. I have lots of experience going to industry events and meeting interesting individuals in tech. I've been to CES, PAX, GDC, Google IO, Microsoft Build, and many Microsoft Mixed Reality events. Personally, I'm a big fan of hiking, video games, debating for the purposes of understanding, as well as swimming, sailing, and biking. I'm proficient in German and I've taken two years of French in High School. I've also participated in the speech and debate team, the NJROTC, the soccer team, and a group called Californian's for Justice in my various High Schools. If you're interested in contacting me about an employment opportunity or something else feel free to contact me by any method listed below. Email is the quickest and most reliable way to get in contact with me. Google Plus It'll never die!